Buy Chinese Panda gold coins. This includes current year gold Pandas, which are available in 1 gram, 3 gram, 8 gram, 15 gram and 30 gram sizes, and backyear gold Pandas, which are available in 1/10 ounce, 1/4 ounce, 1/2 ounce and 1 ounce sizes. 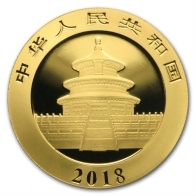 All Chinese Panda gold coins are issued by the China Mint - the Panda series is also available in silver. Coins may be purchased for worldwide delivery or for tax-free Swiss vault storage.